Local action moves the world, certainly from a climate perspective. Current buzzwords like “cities” and “climate leadership” are used in the media, trying to create a sense of hope for the future in a world facing climate change. The reality that urgent action is needed – in terms of both reducing greenhouse (GHG) gas emissions and responding to climate impacts – is driving local leaders to engage. With growing urban populations, local governments responsible for cities and towns have a key role to play. This requires foresight, planning for growth, planning for effective service delivery, and resilient infrastructure. By 2050 70 percent of the world’s population will live in urban areas. Already today, cities are estimated to emit 70 percent of the world‘s energy-related greenhouse gas emissions. These global trends need local responses right now. 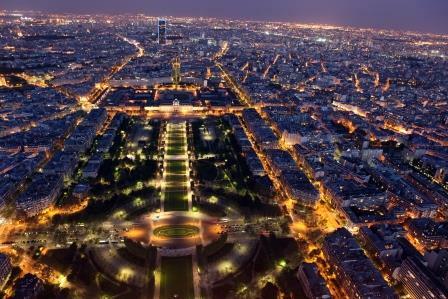 Paris, the host of the next UN Climate COP, by night. Climate change offers opportunities for us to innovate, to stimulate and structure the green economy, and to improve quality of life. The New Climate Economy (NCE) report released last year states that cities from emerging economies in particular are predicted to account for over a quarter of global income growth over the next two decades. There could, and should, be a direct link to low emission resilient development in these countries. This is, however, also an opportunity for all national, subnational, and local governments, whether in the Global North or South. Given the need for action, for leadership, and for a structured and well-managed approach to plan, guide and drive this process, we should focus on the local level. Bold leadership is called for to address climate change at the level where sustainable change can be accomplished. To mobilize and support local governments around the globe, the Compact of Mayors was launched last September at the UN Climate Summit in New York to tackle global climate change and its impacts. This joint effort by ICLEI, C40 and UCLG constitutes an unprecedented global cooperation to reduce emissions, track progress and prepare for the impacts of climate change. This innovative approach towards GHG inventories involves requesting local governments to use the new global GHG emission accounting and reporting standard – the Global Protocol for Community-scale GHG Emission Inventories (the GPC). This provides a consistent, transparent and internationally recognized approach to measuring and reporting city-wide emissions. However, climate mitigation is not the only goal. Planning, implementing and reporting on climate change adaptation and resilience are other key elements of the Compact of Mayors. Here, guidance will be offered to local governments to achieve Compact Compliance. Cities and towns around the world will earn this label by engaging and reporting. By providing evidence-based climate data, the Compact will efficiently demonstrate the value of local climate action and will ideally lead to intensified investments in effective local projects and programs. Reported directly by local governments in the carbonn Climate Registry (cCR) – the Compact’s designated central repository – as well as to CDP Cities, data will be analyzed and used to send clear messages. The Compact of Mayors will help cities and towns across the globe to raise their levels of ambition and to enter a new era of transparency and recognition of local climate commitment and action. The Compact of Mayors is the world’s largest cooperative effort among mayors and city officials to reduce greenhouse gas emissions, track progress, and prepare for the impacts of climate change. Key partners of the Compact of Mayors are the world’s preeminent global city networks – C40 Cities Climate Leadership Group (C40), ICLEI – Local Governments for Sustainability (ICLEI), and the United Cities and Local Governments (UCLG) – with support from the UN Secretary General’s Office, the UN SG’s Special Envoy on Cities and Climate Change, and UN-Habitat. For more information on the Compact of Mayors, please click here. Mona is a Project Officer in ICLEI's Low Carbon Cities program. She promotes the agenda's projects and initiatives, and acts as a liaison for internal and external stakeholders.